Welcome to Forge of Empires! Take charge of a mighty empire: Build your city, lead it successfully through the ages, research new technologies, conquer the world and triumph over your opponents. You start as the leader of a small tribe. Over time you will develop yourself – you will explore new technologies, conquer territories and build your small village into a grand metropolis. The game is divided roughly into ages. You start off in the Stone Age, and will travel through the Bronze Age, Iron Age, the various phases of the Middle Ages, Colonial Age and Industrial Age. Then you can move into more recent times with the Progressive Era, Modern Era, Postmodern Era and Contemporary Era. After that, we will venture slightly into the Future and it will get a lot colder in the Arctic Future. You will reach a new age by unlocking a technology of that period in your research tree. Once you enter into a new age, you will receive a new city hall and your old one will automatically be replaced. In most cases, upon entry into a new age, you can immediately build a few buildings of that age. Developing and managing your city is not all. On the continent map, you can enlarge your empire as you bring it into your possession, province by province. It is worthwhile, because it provides you with valuable rewards. The continent map is divided into sections that roughly correspond to the game ages. Your progress on the map corresponds approximately to your growth in research. And behold - there is a whole world beyond the continent map, with other maps and more adventures. The nuts and bolts of a successful city is production. 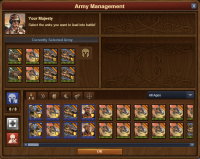 Only if you produce enough coins and supplies will you be able to get the newest buildings and military units. Be sure, though, to have as many residential buildings and production buildings as possible, since they give you your main income. Compare the buildings you are able to build carefully – there is always a building that is best suited to your playing style. Almost as important is the happiness level of your people, because if your citizens are happy, their production is much more efficient. So build cultural buildings and decorations, and always try to keep your people inspired. At the top of your city view in the center, there is a display showing your Forge Points. Every hour you get one more, until you have reached your maximum. 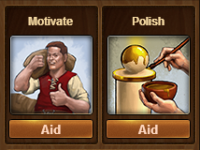 These points are the engine that drives forth your empire: You need them to trade, to level up Great Buildings and, more importantly, for research. You conduct research by investing into technologies in the research tree with your points. If you have come up with the required amount and (if necessary) the unlocking costs, the advantages of the new technology will be available to you and you can build something new in your city from your building menu. On the left of the screen you will see portraits of your advisors. If you click on one, you can do quests for them. Quests let you delve deeper into the game world, and they tell you the history of the world, its countries and rulers. Fulfilling quests is worth it – because you get interesting rewards such as goods, coins, supplies, units that are not tied to slots in military buildings, and diamonds. There are basically two different types of quests. Your right hand man, Ragu Silvertongue, leads you through the main story. You cannot refuse his quests – you have to do them. At a later point in the game there will be a second questline with an additional storyline, quests which you can't abort either. Your other advisors give you very different assignments: Your architect Fernikus will often ask you to construct buildings, and your scientist Mandrubar will push for research. You can reject or discard those quests of your other advisors. There is no shame in doing so, and if you doubt a quest fits into your strategy, you can reject or discard it. This may even occasionally be necessary, because unlike the quests of Ragu Silvertongue, it might happen that your advisors gives you an unattainable quest. Most of the quests that you reject are, then, however, irrevocably gone, and you will get no chance to do them later. But this is no big deal – it's impossible to see all the quests in the game, and you will receive only tasks that are adequate for your current situation in the game – and often a variety of possible situations are included. Therefore, if you reject a specific quest, you will get another to replace it. You should never lose sight of the continent map. Acquire provinces, because only then will you get more expansions you can place in your city and can utilize essential good deposits. Whether you trade for your sectors or conquer them is your decision. At first, it is easy to defeat the armies of your enemy with military units, but soon the battles become more challenging. You are not alone in the world: In your neighborhood you can find other players with whom you can trade. If you deal well with others, they might visit your town and support you. Of course you can also visit cities and polish or motivate the buildings of your fellow players. This gives you a few extra coins that can be of good use early in the game, as well as a small chance to find a valuable blueprint-piece for a Great Building. Great Buildings will provide great advantages to any player that manages to build one. In addition to peaceful coexistence, you also have the opportunity to fight against your neighbors. If you and your attacking army defeat the defenders of the enemy, you can plunder a building – this can generate additional income, but you should realize that such behavior does not win you friends. However, if you participate in tournaments, you can get coveted medals, but there will be almost no way around having to fight a lot. After some time you will need goods. Always keep in mind and plan ahead as to ensure you never get to a point where you are stuck because you lack the necessary goods. You do not have to produce all the goods yourself – concentrate on those which you found good deposits for on the continent map. Team up with other players and trade these goods with them to get ones you don't have. You can also exchange goods with non-player dealers; but their exchange rate is so bad that you should do it only if you really have no other choice. There is also another way to get goods: If you employ your army, with skill and good timing, you can rob your neighbor of goods productions. In battle: infiltrate! Look at the enemy's set up and employ counter units, use terrain advantages and attack a unit with several units! You can find small incidents in your city and the surrounding land, coast and sea. This page was last modified on 22 April 2019, at 12:28.